This e-learning is aimed specifically at organisations that build and maintain homes such as social housing providers and construction companies. This course is aimed at managers with responsibilities for contractors during the construction process in line with the CDM 2015 Regulations. It deals with project team responsibilities, contractor selection and management. This e-learning course has been designed to give more detailed guidance to Community Safety Officers on what to do when encountering ASB and the legal options available. This course covers how to recognise and prevent money laundering in the regulated sector. 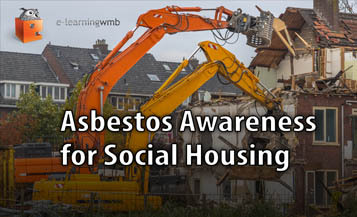 This course is aimed specifically at Neighbourhood Officers, giving them the skills to deal with asbestos cases effectively and to impart appropriate information to the tenants. This e-learning offers a good understanding of what constitutes bribery and its impact on Social Housing from both a local and wider perspective. This e-learning is intended to help staff apply for funds and run local projects. This course gives basic CDM Training for Clients and Managing Agents who will instruct and work with contractors and designers throughout the construction process. This course gives a general introduction to the Construction Design and Management (CDM) regulations for all members of the project team. It examines the roles of the main duty holders under the Regulations and how to select and manage contractors. This session will look at how we record complaints and compliments, what processes to follow, and how we (as a business) learn from them. "Learn how to deliver excellent customer service and recognise bad customer service. Customer service is dealt with externally and internally with worked examples. Training is also given in how to learn from customer insights." This course is aimed specifically at Social Housing and/or Construction companies who wish to create their own customisable induction. Each course is supplied with Jackdaw Cloud Authoring software which enables online editing of the e-learning. Introduction to Governance for Social Housing Providers e-learning covers what is governance and the board's role in adhering to good corporate governance This course addresses the unique requirements with regards to regulation and profit making in the Social Housing sector. This course gives an introduction to the charity StepChange and what they can do to help tenants in debt. This course looks at the causes of debt and how to recognise them. This looks at the procedure for referring a customer or tenant to the charity. This shows how tenants can be worked with to resolve their debt problems. This Introduction to Estate Management course outlines the importance of good estate management and the role of the Neighbourhood Officer in managing and planning estates. This course educates employees on providing an excellent level of customer service to homeowners as well as understand more about homeownership. It also instructs the learner on where to find further information where necessary. This course involves an overview of housing associations, what they are and the job they do. This can be used as part of employee induction. This e-learning is designed to give you an overview of Fundraising. To get the most out of this e-learning course, it would help to have an idea of a project you’d like to work on in mind. The e-learning sets out what your duties are as a social landlord under the Section 20 legislation. It uses case studies to illustrate the financial impact of failing to comply. The e-learning sets out what your duties are as staff of a leaseholder under the Section 20 legislation. It uses case studies to illustrate the financial impact of failing to comply. This learning session is aimed at all front line Housing staff who manage tenancies. The course contains information about the types of tenancies, agreements and how to enforce them. "Our Value for Money e-learning course is aimed Social Housing providers in line with the Regulatory Framework requirements. It deals with understanding what value for money is, the framework and what employees and managers can do to make a difference. " This course gives an overview of the Welfare Reform 2013 changes and introduces to the learner how this will affect their job as a social housing provider. This course gives an overview of the Welfare Reform 2013 changes and shows the tenant how this will affect them. All courses are 100% editable in the cloud at no extra cost, each course is supplied with a free version of Jackdaw Cloud to enable the alteration of text and images etc. Should you want access to any course in full then contact sales@e-learningwmb.com stating the course(s) you would like to see and for how many trainees. All courses are also uniquely available across all formats (HTML5, Flash) as SCORM v1.2 packages and on mobile devices. Sign up to use our Jackdaw Free e-learning creation or use and download any of our free courses. Also find out more about our bespoke services. Uniquely All Courses 100% Customisable in the Cloud!